Enterprise IQ's Manufacturing ERP offers an integrated ERP and manufacturing system that covers nearly all the functions necessary for running a factory floor. The application offers total control over all aspects of the manufacturing operation, from supply chain management to manufacturing processes, as well as scheduling, payroll, and accounting. Manufacturing ERP provides users with a single, unified user interface from which a wide range of manufacturing functions can be controlled. The application also features cost analysis tools to help manufacturers drive ROI across the business, end-to-end. Manufacturing ERP features Oracle database and Microsoft Office integration. There is also a customizable ROI, and solutions can be further tailored to suit unique operations, in consultation with IQMS. Overall, we are happy with IQMS. We are a plastic injection molding company and we use the system from quote to cash. It is our central point of information and connectivity between departments. We are intending to expand our usage of the system in the future by adding other modules. Our reporting capabilities are significantly increased through the usage of this system as well. We use the IQAlert and IQVoice systems on a daily basis to stay ahead of issues and report problems immediately to the manufacturing floor. RealTime screens are running throughout the plant so we have an instant visual on how the day is going. Overall, this has been a great benefit to our company and has helped us grow our business.The Real time access to information is my favorite thing about this software. We use the modules to connect to the machines and this information drives many of our decisions. The system has a great deal of functionality, and I know we are not utilizing it to its fullest. It has helped us as we are growing as a manufacturing company. The Real time access to information is my favorite thing about this software. We use the modules to connect to the machines and this information drives many of our decisions. The system has a great deal of functionality, and I know we are not utilizing it to its fullest. It has helped us as we are growing as a manufacturing company. I do not like having to upgrade to a whole new version when we need to make a change. It would be nice if we could simply update with a patch. It takes a long time to get a solution to a system issue and we are often making work arounds. I know they are beginning to offer web-based solutions that will probably largely eliminate this issue. (Although, development and corrections will still take time I'm sure). Also, I feel as though the customer service has gone down since we began with them in 2011. I tend to only call support when I'm really stuck with an issue. More often then not, I'm directed to help pages that I've already read and still didn't resolve my issue. The feeling within our company is very positive regarding EnterpriseIQ. It is a package that appears to have been essentially co-developed by plastics processors through customer feedback. With that, it has been a great tool to streamline our operation. This, being like many other things, you will get out of it what you put into it. We are a small company with many of us wearing many proverbial hats. Consequently, none of us are dedicated toward ERP utilization / improvement. With that and as expected, expanded use of the software is coming around at a slower pace. I have no regrets in having recommended the purchase of Enterprise IQ. If I knew then what I know know about the software, I would make the same purchase decision.A 'One Stop Shop' for just about any need for which a database is applicable within the plastic injection molding industry. Having used separate application software programs prior to IQMS, integration has been a huge benefit and future integration is still an opprortunity. Although I have only monitored it up to this point, the level of information shared by the User Group is amazing. IQMS Staff, regardless of department, have always been extremely pleasant to deal with eith on the phone or by email. Tech Support's ability to easily remote in and troubleshoot has been helpful. Implementation was smooth , facilitated by the knowledge, experience, and confidence of the IQ implementation specialist assigned to us. We began using scheduling very quickly upon installation; something I was unable to do with another ERP program with which I had exposure. Taking it's power into consideration, IQ is easy to learn and begin using. A 'One Stop Shop' for just about any need for which a database is applicable within the plastic injection molding industry. Having used separate application software programs prior to IQMS, integration has been a huge benefit and future integration is still an opprortunity. Although I have only monitored it up to this point, the level of information shared by the User Group is amazing. IQMS Staff, regardless of department, have always been extremely pleasant to deal with eith on the phone or by email. Tech Support's ability to easily remote in and troubleshoot has been helpful. Implementation was smooth , facilitated by the knowledge, experience, and confidence of the IQ implementation specialist assigned to us. We began using scheduling very quickly upon installation; something I was unable to do with another ERP program with which I had exposure. Taking it's power into consideration, IQ is easy to learn and begin using. While Tech Support is responsive and interaction is positive, the need to coordinate a time to "remote in" is not always convenient and sometimes discouraged me from calling or emailing. While Securities are very powerful and flexible, it seems there is complexity that comes with that power. Mastering securities is not something that appears to be intuitive or quickly/easily learned. Given the power and potential flexibility of the software, it does require a resource dedicated (at least to some degree) in order to tap into that power and expand use into it's many features. Cost as well as internal resources have prevented us from seriously considering additional modules and/or consulting visits from IQMS implementation specialists to improve utilization. The depth and breadth of the program is impressive. I like the flexibly of use from a small section of manufacturing process, to using it fully from quoting, production and quality testing. Consistency but continued expansion of the IQMS program is appreciated (I am a user since 2004). Help desk can be very responsive when it comes to problems/questions arising. If it is a major problem they will `take you by the hand solve it with you. With the interface I appreciate the ability to jump from window to window to window. I also appreciate it is a multi-window program. The structure of the database not being directly linked to the naming scheme of the interface can be frustrating when creating reports or finding problems. The structure of security section is hard to manage (groups and sections instead of individual profiles and direct security approvals). Not being able to easily substitute alternative items in the BOMs/Work orders can be a hindrance to accurate consumption. Also the structure of the consumption can be awkward. If a change is needed to the program a committee gathers once a year to vote on the focus of the upgrades and improvements, is the process to update errors to the computer system, instead of a more instant solution (though if it is obvious they will fix it sooner). Employees that are not fully engaged sometimes have difficulty understanding and/or utilizing the efficiencies inherent in IQ. However, several cost and time effective training options are available that range from learning basic navigation/software capability skills thru expanding knowledge of application specific IQ functionality. Security Administration can be fairly complex and cumbersome to maintain, especially after software updates although there has been recent improvement in this area. I can only speak from the perspective of injection molding, but we have found EnterpriseIQ to be a very good fit for our business. It is very strong in Scheduling, Quality, CRM, Real-Time Press Monitoring, Warehouse/Inventory Management, and Asset Management, as well as the core ERP functions (AR, AP, etc.) (We do not run EDI so I can't comment). NBP is running far more efficiently now than before we implemented IQ. We painstakingly evaluated many software packages prior to making our selection, and we are glad that we chose EnterpriseIQ. I recommend it wholeheartedly. EnterpriseIQ is the intelligent choice.EnterpriseIQ is a very comprehensive and robust ERP system. We were able to consolidate our old ERP and several independent, and often redundant databases, spreadsheets and other systems into one central application. In general, the system is reliable and easy to maintain. Support is good, readily available, and domestic. No pressing (1) for English. IQMS as a company seems to value its customers, and is responsive to their needs and wants as a whole. The software is continually being enhanced, both in depth and breadth. The MRP engine is powerful and very quick, taking just a few minutes to generate. Overall, the system is very intuitive and user friendly. New users are able to learn and become functional quickly. Additionally, great training is available in person or via the web. IQMS is very integrated, so it is easy to jump from one module to another without having to navigate endless menus. IQMS comes with many pre-written reports and customization is relatively easy with CR. EnterpriseIQ is a very comprehensive and robust ERP system. We were able to consolidate our old ERP and several independent, and often redundant databases, spreadsheets and other systems into one central application. In general, the system is reliable and easy to maintain. Support is good, readily available, and domestic. No pressing (1) for English. IQMS as a company seems to value its customers, and is responsive to their needs and wants as a whole. The software is continually being enhanced, both in depth and breadth. The MRP engine is powerful and very quick, taking just a few minutes to generate. Overall, the system is very intuitive and user friendly. New users are able to learn and become functional quickly. Additionally, great training is available in person or via the web. IQMS is very integrated, so it is easy to jump from one module to another without having to navigate endless menus. IQMS comes with many pre-written reports and customization is relatively easy with CR. In the grand scheme of things, relative to other ERP systems, there are few drawbacks to IQMS, and no showstoppers for NBP. Occasionally the MRP engine creates a work order that doesn't seem to have any demand, so sometimes I have to evaluate the need for an order manually to be sure. Security/permissions for the system is a bit cumbersome at times, but IQMS has improved that recently and continues to work on it. Alerts seems to be a bit unstable. I don't know if that is a widespread issue or unique to us, but I frequently have to restart the app. We have not been able to get IQ to fit our needs for quoting, but in all fairness our system is fairly elaborate. We also found the Workforce module to be weak. 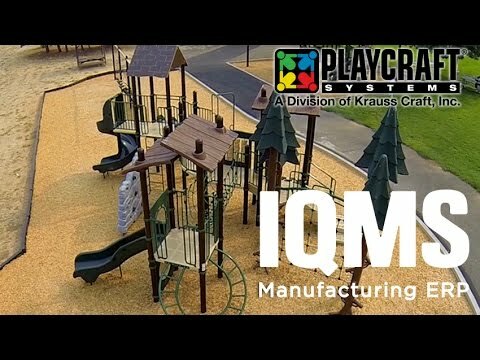 Please contact IQMS directly for pricing information. •	Integrate multiple systems in Manufacturing ERP to lower costs. •	Manage all aspects of business from a single interface, with total oversight of ROI across the board. •	Receive streamlined updates for all systems at regular intervals. •	Identify inconsistencies with real-time monitoring and detailed reporting. •	Find specific problems and troubleshoot them quickly with Manufacturing ERP. Below are some frequently asked questions for Manufacturing ERP. Q. What type of pricing plans does Manufacturing ERP offer? Q. Who are the typical users of Manufacturing ERP? Q. What languages does Manufacturing ERP support? Q. Does Manufacturing ERP support mobile devices? Q. Does Manufacturing ERP offer an API? Yes, Manufacturing ERP has an API available for use. Q. What other apps does Manufacturing ERP integrate with? Q. What level of support does Manufacturing ERP offer? Q. Which apps is Manufacturing ERP compared to most often?